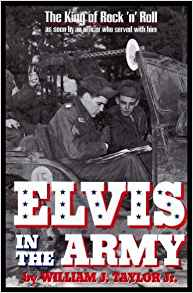 A fun book, Elvis in the Army looks at the King of Rock and Roll's time as a draftee. He served in Germany as a scout for an armored battalion, a critical job but one that seemed to be perfect for Private Presley for a number of reasons. Taylor talks about some of the interesting things he saw during Elvis's tour in Germany due to his enormous popularity, as well as the ordinary, down-to-earth soldier he got to know. Definitely worth reading if you're interested in Elvis Presley.